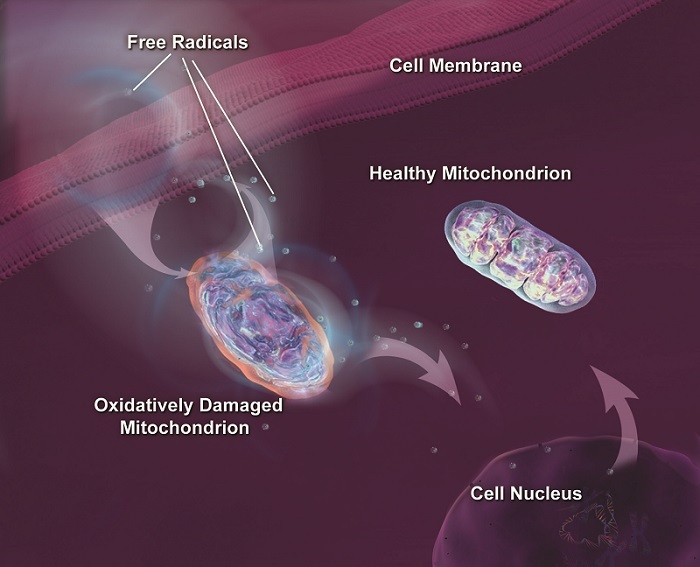 New findings on the free radical theory of aging and mitochondrial damage. Free radicals are especially reactive atoms or groups of atoms that have one or more unpaired electrons. They are produced in the body as a by-product of normal metabolism and can also be introduced from an outside source, such as tobacco smoke, or other toxins. Free radicals can damage cells, proteins and DNA by altering their chemical structure. When researchers at the Buck Institute bred mice that produced excess free radicals that damaged the mitochondria in their skin, they expected to see accelerated aging across the mouse lifespan, additional proof of the free radical theory of aging. Instead, they saw accelerated wound healing due to increased epidermal differentiation and re-epithelialization in young animals. The study is published in the journal Proceedings of the National Academy of Sciences. The data findings shed light on current apparent discrepancies regarding the role of free radicals as a driver of the aging process. the team state that excessive amounts of free radicals are known to cause cellular damage that leads to aging, however, in some previous mouse models and human studies lowering free radicals with antioxidants have not always conferred the expected benefits. The current study used mice which were bred to more closely mimic the stress that occurs over time in human skin and respond in a manner similar to humans. This team state that their study shows that it’s essential to look across the entire lifespan when researchers examine mechanisms implicated in the aging process. They go on to add that while increased free radical production showed benefit in younger animals, the mice paid a price over time. The current study showed that mitochondrial damage from excess free radicals caused some of the skin cells to go into senescence, they stopped dividing and started accumulating. The results showed that over time the energy available to the epidermal stems cells was depleted, the stem cells simply became too scarce and the mice showed expected signs of aging, thin skin and poor wound healing. In this case the data findings showed unexpected pleotropic effects, mechanisms that benefit the person when they’re young and cause problems as the body ages. In addition to the complications caused by senescence the current study also showed that mitochondrial stress caused by the increase in free radicals also forced the skin cells in the younger animals to differentiate faster than normal, further depleting the pool of stem cells available to renew the skin over time. The lab explain that this is not a simple process, and that it may be that nature used free radicals to optimize skin health. However, the researchers go on to add, because this process is not deleterious to the organism until later in life, past its reproductive age, there was no need to evolve ways to alter this mechanism. The team conclude that there could be one practical implication of the study, and that is taking large amounts of anti-oxidants might have deleterious effects, at least in the skin. However, the researchers said they could “identify a previously unidentified age-dependent role for mitochondria in quality and wound closure,” and repeated the age-dependent phrase in the study title. I guess the “age was the cause” meme is hard to stop repeating.